of dry matter occurs when the temperature ranges between 20 and 30°C, provided moisture is not a limiting factor. High temperature can devernalize cryophytes, especially the buds of sun-exposed deciduous trees. When high temperature occurs in combination with high humidity, it favors the development of many plant diseases. High temperature also affects plant metabolism. High night temperature increases respiration. It favors the growth of the shoot and leaves at the cost of roots, stolons, cambium, and fruits. It governs the distribution of photosynthates among the different organs of the plants, favoring those which are generally not useful for human consumption. High night temperature also affects plant metabolism. It accelerates the development of noncryophytes. Most crop plants are injured and many are killed when the night temperature is very low. Tender leaves and flowers are very sensitive to low temperature and frost. Plants that are rapidly growing and flowering are easily killed. Low temperature interferes with the respiration of plants. 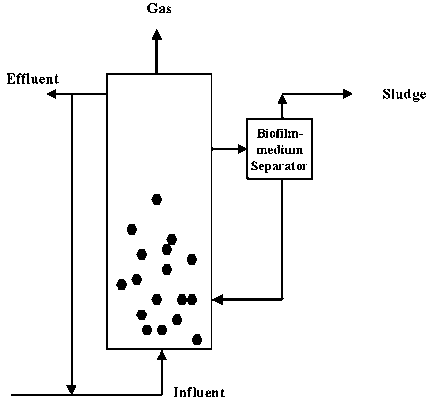 If low temperature coincides with wet soil, it results in the accumulation of harmful products in the plant cells. Frost also interferes with plant metabolism. Spring wheat grain yields generally decline as temperature increases. Temperature stress intensity is severe under late sowing, causing a reduction in the duration of later growth phases. Grain test weight, spikelets/spike, and grains/spike under hot (normal sowing) environments and spike length and spikes/m2 under very hot (late sowing) environments are adversely affected. Other factors that significantly contribute to yield under high temperatures are tiller numbers and reduced height (Hanchinal et al., 1994; Frank and Bauer, 1996; Chowdhury, Kulshrestha, and Deshumukh, 1996). Grain yield of rice is highly correlated with minimum temperature. A prediction model in the Philippines (Pamplona et al., 1995) showed that the high yield observed especially during the dry season is due to lower minimum temperature. Higher grain yield corresponds with a seasonal minimum temperature of 22.5°C, compared to an average seasonal minimum temperature of 24.2°C. Reasons for low and variable cotton yields are associated with extremes of temperatures (Oosterhuis, 1997). Yield and fiber characteristics respond to variations of daily mean and amplitude of temperature (Liakatas, Rous-sopoulos, and Whittington, 1998). Mean temperature reduction improves yield components, but high temperatures, particularly high day temperatures, increase fiber length, uniformity, and strength. Large daily temperature amplitude produces an intermediate number of flowers and the lowest retention percentage. Fruiting and yield are increased by a reduction in temperature down to the threshold mean temperature of 22°C. An adverse effect of low minimum temperature on lint and fiber properties was also observed. Sowing date, reflecting temperature conditions, significantly affected phenology (time to emergence, flowering, and maturity) and pod yield of groundnut. The observed responses appear to have been due to the effect of temperature differences on partitioning during the pod-filling phase (Ntare, Williams, and Ndunguru, 1998). The rate of photosynthesis and respiration increases with an increase in temperature, until a maximum value of photosynthesis is reached. This value is maintained over a broad range of temperatures (Figures 3.2 and 3.3). Then, at considerably higher temperatures, when the enzyme becomes inactivated and various reactions are disturbed, photosynthesis decreases and ultimately stops. 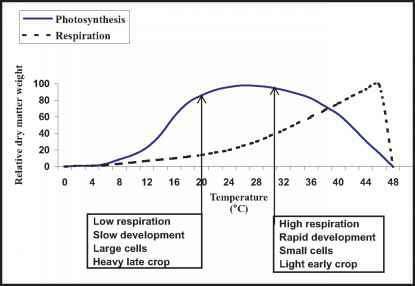 range of temperatures, the rate of respiration increases, diminishing the net photosynthetic yield. The temperature limits for net photosynthesis for some plant groups are given in Table 3.2.